Its time for contributing to thenationdevelopment by helping government’s step to eradicate blackmoney ,a big and bold decision taken by Prime Minister NarendraModi. To ensure smooth transition of the currency , RBI has issuedanadvisory to help people, how they can exchange their oldnotes,from where they can exchange old notes including banks andpostaloffices. This app contains all the latest updates from RBI.We'llregularly update the latest guidelines on how to exchange your500and 1000 rupee notes and what steps to take. Check for the update to get the latest informationaboutadvisory. Stay calm, and be a part of next generation India. If you want to keep all your apps and android system to the latestupdated version then try this application. This app will help youkeep updated to the latest apps and system software. Major featuresof the application : - Find latest updates for all your appsinstalled in your device. - Uninstall unnecessary apps from yourdevice. - Check your latest system update version. - Clear cachefiles for better device performance. - Scan and delete emptyfolders. The app also provide information like - Current appversion installed in your device. - Latest available version of theapp. - Package id of your installed application. - 1st Installeddate and modified or updated date of your apps. Now use this application to check if your phone supports 4G VoLTEor 4G LTE. It's becoming necessary to have a 4G VoLTE supportivephones due to up gradation of mobile technologies. The app alsoprovides important phone software and hardware information which isvery essential for all mobile users to know. App features : - Checkif your phone supports 4G VoLTE or LTE technology. - Get essentialPhone information. - 2G to 3g and 3G to 2G converter. - Getcomplete guideline on VoLTE technology. - We advice you to Switchto 4G VoLTE. - Get all the internet data pack plans and all new 4Gplans details from this application. Latest 4G and recharge plansof vodafone, gio, airtel, reliance and other Indian Mobilenetworks. A must have application for all those who wants to learn thelanguage English or Hindi. All features are available in English toHindi or Hindi to English. You can use this educational app fordaily conversation, learning, improving your language command, asmobile handy dictionary, for chatting in Hindi or English.Teachers, students, traveler, layers, professionals and many morecan use this application. App features: - Dictionary with 5000+words.- Dictionary with English to Hindi or Hindi to English words.- Dictionary features like, meaning, synonyms, antonyms, examplesentences and similar words. - You can speak and search the word indictionary. The dictionary will pronounce the words for you.- Besttranslator from English to Hindi and Hindi to English. InbuiltHindi Keyboard. - Voice input: you can speak and input sentences orwords in dictionary or translator. You can input voice on bothEnglish and Hindi Languages. - Translation can be done by voice.The app uses voice recognization technique.. - Get daily word ofthe day and sentence of the day. - Search photos of word entered byyou for better understanding. If you want to get information of any vehicle number, you don'tneed go to RTO or anywhere else. Just use Indian Vehicle RTO Info.Enter the Vehicle Registration number on any Indian Vehicle and getcomplete details of it. You will get the following details : OwnerName Owner's Address Registering Authority Maker Model EngineNumber Chassis Number Registration Date Registration City VehicleType Vehicle Model Name Vehicle Age City State You get all andcorrect information that is present in RC (Registration Certificatebook) No matter your vehicle is registered in Maharashtra, Gujarat,Karnataka, Kerala, Assam, Punjab, Goa, Or any other state of India,you'll get all the information in one app. So download this veryuseful app and always have it in your mobile. India has accepted the demonetization schemeofour Prime Minister Narendra Modi very positively. To showyoursupport towards demonetization of 1000 and 500 currencynotes,create a profile pictures using this application and uploadit onsocial network.Let's support this major steps taken by BJP Government toeradicatecorruption, black money and terrorism funding.How to create profile pic:Few easy steps and you are done.- Choose a photo from mobile gallery or click a new one usingmobilecamera.- Crop using advanced cropping feature.- Add Frames specifically designed to show support toDemonetizationof Currency notes.- Apply different photo filters and save your edited photo.- Share your photo directly from the app to social networkingsitesor apps. You can get your makeover as a Gangsterusingthis application. The app contains many stickers which can beaddedon your photo to make you look real Gangster. You can try iton anyclose up photo of yours or your friend and share it on socialappsand sites or even place it as profile picture.App features :+ Create natural looking Gangster photo out of yourphotos.+ The app contains many Gangster theme stickers like face mask,goldchains and lockets, glasses, caps and hats, golden teeth,braces,face scars and scratches etc.+ Easy to use application with placing sticker objects withyourfinger touch.+ Add multiple Gangster Stickers on your photo.+ Apply different photo filters to give final touch.+ Easy save and share your edited pic on Facebook, whats appandother social apps and sites.+ Create unlimited Gangster photos of your friends usingthisapplication. As explained in Modi ke note we Know thatrecently announced by Prime Minister Of India Mr. Narendra modithat From Midnight of the 8th November, regular currency note ofRs. 500/- & 1000/- has been banned in india.Modi ke note explained This is one of the very big step taken byour government till now in the direction of country empowerment,the Dicision was taken suddenly & very smartly by thegovernment which is for the Black Money holder in country, as wellas for reducing the inlegall activity which is supported with thatBlack Money, The action also taken due to terrarist action which isfunding from duplicate indian currency.so we should welcome the PM Dicision for Currency Exchange becauseit will makes a drastic change in a normal citizenslifestyle.All process & details for all issue about currency has beensolved in the Application of Indian Currency Exchange Guide. thismay be helpful for userIf you Still have Notes of 500/- & 1000/- ????? ?No need to be afraid, because your money will be yoursonly.Citizens have to follow some steps easily & co-operategovernment actions.Just take your cash notes of 500 & 1000, original IDproofGo to your bank then fill Note Exchange forms with properdetailsThats it !!!!!!!!! !if the content was useful please share with other.Disclaimer:This is Not any Official Application of Any Company orGovernment, the content was taken from public sectors, we are notresponsible for any misunderstanding in content.The Application made for the purpose of normal citizen awarenessabout situations, if there is any issue related to Application,please contact us on our e-mail address. we will respond youimmidiately. Change Notes Rs 500, 1000 App gives allinformation about the change of currency notes in India due toblack money.Prime Minister Mr. Narendra Modi on 8th November 2016 at 8:00 p.m.IST declared Rs 500 notes and Rs 1000 notes will be banned in Indiafrom midnight and new currency notes of denomination Rs 2000 andRs. 500 have been launched.This app gives following information.1. How to use and change old currency.2. Limit details to deposit and withdrawal of old and newcurrency.3. About new 500 & 2000 currency.4. ATM withdrawal limits.5. Currency submission form.6. Black money in India. 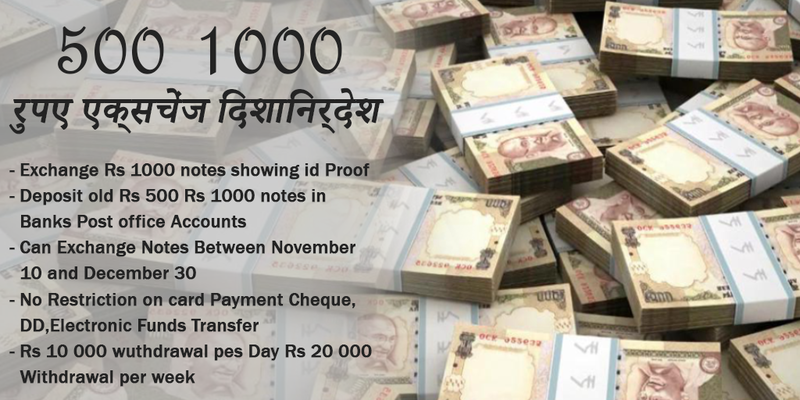 As explained in Change Notes Rs 500, 1000weKnow that recently announced by Prime Minister Of IndiaMr.Narendra Modi that From Midnight of the 8th November,regularcurrency note of Rs. 500/- & 1000/- has been bannedinindia.Change Notes Rs 500, 1000 explained This is one of the very bigsteptaken by our government till now in the direction ofcountryempowerment, the Dicision was taken suddenly & verysmartly bythe government which is for the Black Money holder incountry, aswell as for reducing the inlegall activity which issupported withthat Black Money, The action also taken due toterrarist actionwhich is funding from duplicate indiancurrency.so we should welcome the PM Dicision for Currency Exchangebecauseit will makes a drastic change in a normalcitizenslifestyle.All process & details for all issue about currency hasbeensolved in the Application of Indian Currency Exchange Guide.thismay be helpful for userIf you Still have Notes of 500/- & 1000/- ????? ?No need to be afraid, because your money will beyoursonly.Citizens have to follow some steps easily &co-operategovernment actions.Just take your cash notes of 500 & 1000, original IDproofGo to your bank then fill Note Exchange forms withproperdetailsThats it !!!!!!!!! !if the content was useful please share with other.Disclaimer:This is Not any Official Application of Any CompanyorGovernment, the content was taken from public sectors, we arenotresponsible for any misunderstanding in content.The Application made for the purpose of normal citizenawarenessabout situations, if there is any issue related toApplication,please contact us on our e-mail address. we willrespond youimmidiately. Change Notes Rs 500, 1000 App givesallinformation about the change of currency notes in India duetoblack money.Prime Minister Mr. Narendra Modi on 8th November 2016 at 8:00p.m.IST declared Rs 500 notes and Rs 1000 notes will be banned inIndiafrom midnight and new currency notes of denomination Rs 2000andRs. 500 have been launched.This app gives following information.1. How to use and change old currency.2. Limit details to deposit and withdrawal of old andnewcurrency.3. About new 500 & 2000 currency.4. ATM withdrawal limits.5. Currency submission form.7.Cash deposit tax calculation table6. Black money in India. 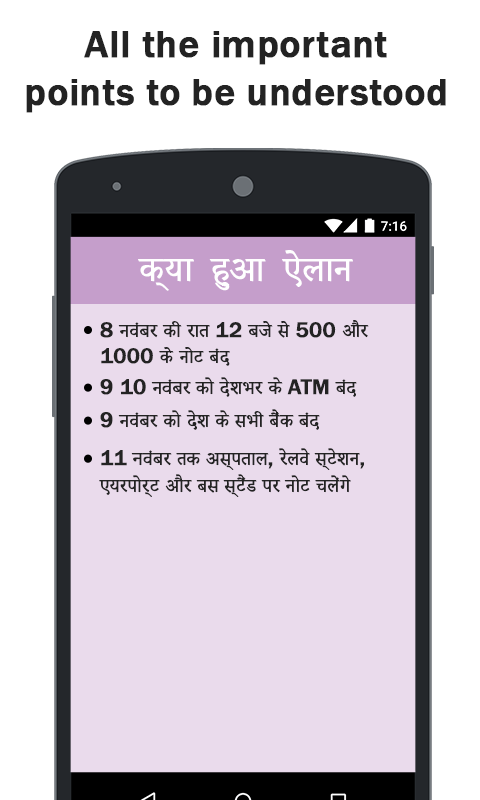 Latest update: 1> Now the app will scan and detect all Indiancurrency notes for you. Start the camera using this application andplace it over any Indian Currency note and the app will scan anddetect the Indian Currency note for you. 2> Create your photoswith new Indian Currency photo frames. Replace your photo withphoto of Ghandhiji and share it on social network. Customize yourown currency note. This app will help you to know the currencynotes of 500 and 2000 rupee notes. 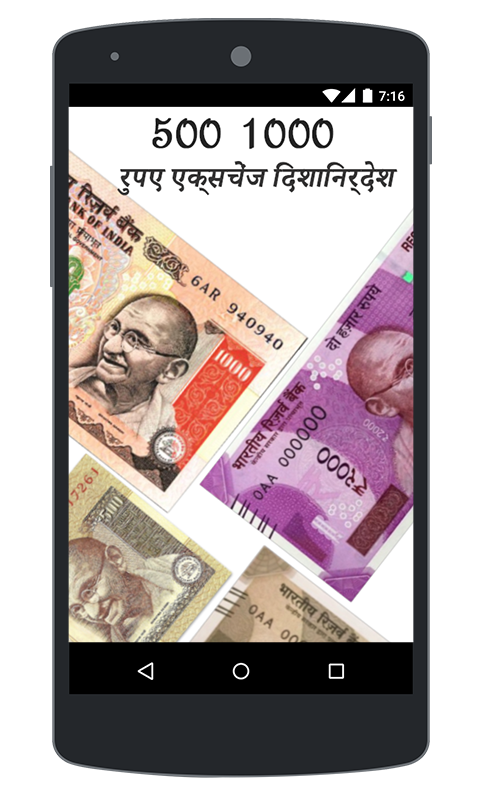 The app contains completeguideline and features of your new 500 and 2000 currency notes.Download this app and get your knowledge updated about the new 500and 2000 currency notes. We totally appreciate to such a bold moveofour Prime Minister Narendra Modi for demonetizing 500 and1000Rupees Notes.This move is very respectable in favour of country tofightagainst corruption and black money.This mobile application is developed in public interest toinformor educate people of india who has various questions ordoubts aboutexchanging demonetized notes of 500 and 1000 Rs.People can find outthe guidelines or can find their answers fromthis application.Recently *How to Convert Black Money to White Money* Questionisfamous in India. You can download this app for latest newsrelatedto this topic.We will update the application as much as data we willgetavailable from officials.Note: You can refer thislink:https://m.rbi.org.in/Scripts/FAQView.aspx?Id=119 for thedetailstoo.Jai Hind!